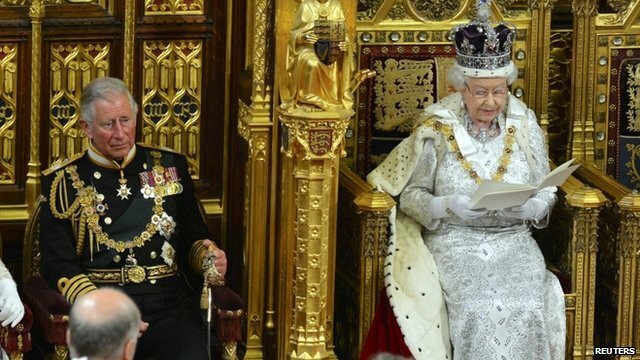 Every year the Queen’s speech heralds the State Opening of Parliament. Drawn up by the Government of the day, it outlines their policies and legislative programme for the upcoming parliamentary session. Yesterday’s Queen’s speech was partly interesting and partly pointless, because the parliamentary session that is upcoming includes a potential political earthquake in the shape of the Scottish referendum, which could result in anything happening – from nothing up to the resignation of the Prime Minister, Parliament voting to bring forward the General Election (the only way that can happen now we have a fixed term) and a possible change of government within six months from now. So this Queen’s speech contained what I would call some “clean up” bills, where both sides of the Coalition got some succour. The result is most probably that, barring the above “earthquake”, the Coalition will stick together until May 7th next year, and have some achievements to come. What wasn’t there was what the Lib Dems wanted – a “mansions tax” – on property wealth – something which David Cameron just couldn’t bring himself to let through. Also not there is any bill on immigration – the reduction of which a legislative statement of intent might have been helpful in the face of the UKIP insurgence – as would a bill to legislate for the EU referendum to be held. Small Business, Enterprise and Employment Bill – fair access to public sector procurement for small firms, a register of who owns and controls British companies, tougher penalties for flouting minimum wage rules and zero hours contracts, flexible childcare arrangements. Both Lib Dems and Conservatives will be pretty happy with what is in here – a mixture of pro-enterprise and pro-worker legislation. National Insurance Contributions Bill – A beefing up of anti-avoidance measures to make sure that arrangements aren’t being made that allow firms and individuals to avoid it. This is more to placate Labour critics of the efforts being made to stop tax avoidance whilst so much is being done to crack-down on welfare ‘fraud’. Infrastructure Bill – This contained a variety of measures – with the two that are most interesting being energy firms being forced to fund a beefed-up regulator – a response to the well-targeted Labour campaign against Energy firms’ monopoly power abuse – and legislation to allow shale gas companies to ‘frack’ under private land without seeking the owners’ consent. The latter is particularly controversial (although leavened by mention of this being ‘subject to public consulation’), but as I have said about fracking before – it could reduce energy bills and help us achieve our carbon emissions targets so unless someone has a better idea we might as well make it easier to start. Pension Tax Bill – This was the already announced policy of allowed people to withdraw all their pension when they retire instead of forcing them to buy an annuity with 75% of their pension pot – which was an annual income at (at the moment) uncompetitive rates which you lose if you die (even if after a year). The aim is to improve the amount people save in a pension as they have control over it at the end, hopefully reducing old-age poverty. Private Pensions Bill – New ‘collective pension’ schemes will be launched. This would allow thousands of people to pay into the same scheme and share the risk. I have already written about these (here) – again another attempt to help encourage people to contribute and increase what they earn in retirement. At the moment someone in the UK would get about 50% less income than someone in Holland paying the same amount in over the same period of time. Childcare Payments Bill – A new tax-free childcare subsidy worth up to £2,000 a year per child will be introduced in the autumn of 2015. This replaces a contribution that employers used to make. It is another policy that will be welcomed by all parties as we continue our search for ways to help women achieve parity in the workplace. Modern Slavery Bill – Relatively uncontroversial (which makes it perfect for this stage in government) it offers the possibility of life sentences to those convicted of the most serious offences, clarifies compensation for victims and makes sure slavery victims forced to commit an offence will not be treated as criminals. Social Action, Responsibility and Heroism Bill – People who are sued after intervening in emergencies or acting to protect the safety of others will have new legal defences – because at the moment it is possible for people who intervene in emergencies to be sued for negligence or for a negative result of what they are doing. This seems to be trying to solve a problem that doesn’t exist – or has only existed in anecdotes (the community police officer refusing to save a drowning child because of health and safety restrictions). However, it is the spirit of the age we are in that it is needed. Service Complaints Bill – added powers to the Commissioner who investigates complaints against the armed forces, leavened by restrictions being lifted on support for armed forces charities. Nothing controversial here. Serious Crime Bill – Knowingly participating in an organised crime group will be an offence, as will the possession of “paedophilic manuals” and attending terrorist training camps or being involved in acts ‘preparatory to terrorism’. Tougher sentences for cybercriminals and those involved in female genital mutilation. A new offence of causing psychological harm to children through parental neglect will be created – which, as I will write about soon – is going to need to be VERY carefully implemented. Recall of MPs Bill – This was actually in the coalition agreement, put there in response to the expenses crisis before the last election and pushed by the Lib Dems in addition to some Tory backbenchers like Zak Goldsmith (great name, no relation to me). If an MP has committed serious wrongdoing, 10% of their constituents have signed a petition AND THE COMMONS AGREES – they could be removed from the seat. I have put the last bit in capitals because it wasn’t the original idea. I imagine it is a way of stopping abuses of the process (10% of Nick Clegg’s constituents petitioning for his recall because he went back on his tuition fee promises) but really – serious wrongdoing just needs to be properly defined. Draft Governance of National Parks (England) and the Broads Bill – to do with the elections of those in charge of these areas of Britain. Possibly tying up a loose end that needed tying up. Draft Riot (Damages) Act Bill – In response to the issues with compensation following the 2011 riots that have been raised – there is a modernisation of the rules surrounding it – particularly in terms of who gets compensation for criminal damage and financial loss as a result of riots – helping individuals and small/medium sized businesses but not very large businesses and insurers. Draft Protection of Charities Bill – the powers of the Charity Commission would be strengthened to tackle those abusing the rules and presenting a “known risk”. As you can see – not much to see here. But enough to keep this government going for a year. Which in the end is all that really mattered. This isn’t the “zombie government” Labour are trying to characterize it as – but it isn’t the all-action hero it would like to be either. « Newark by-election: Why does it matter so much to the Conservatives?